It is no secret that twentieth-century Britain was governed through a culture of secrecy, and secrecy was particularly endemic in military research and defence policy surrounding biological and chemical warfare. More generally, it is hard to exaggerate the role of secrecy in all past biological and chemical warfare programmes and several recent historical surveys of biological and chemical warfare research have emphasised that all state sponsored programmes, together with sub-state organised activities, were cloaked in utmost secrecy. Of these research programmes, Britain carried out one of the most significant in scale and scope in the twentieth century. Yet, partly because of the secrecy surrounding the programme, there is still little academic literature on its historical development. Equally, and despite secrecy being a pervasive feature of past and contemporary societies, social scientists and historians have paid relatively little scholarly attention to the nature, mechanics and effects of secrecy, particularly with regard to secrecy in relation to the production and governance of science and technology. 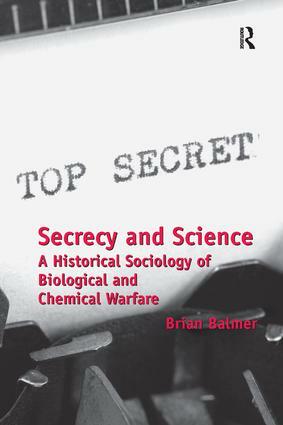 Drawing on classical sociological writing on secrecy by Simmel, Merton and Shils this groundbreaking book by Brian Balmer draws on recently declassified documents to investigate significant episodes in the history of biological and chemical warfare. At the same time, it draws on more contemporary perspectives in science and technology studies that understand knowledge and social order as co-produced within heterogeneous networks of 'things and people' in order to develop a theoretical set of arguments about how the relationship between secrecy and science might be understood.